Oklahoma schools have been closed more than a week. But faced with Republican intransigence, the strike has now reached a critical turning point. Whatever happens in the days to come, teachers and support staff in Oklahoma have etched their imprint onto history. Since Monday, April 2, school has been shut down for the vast majority of Oklahoma’s students. The strike has not only persisted — it has opened the floodgates of a powerful working-class upsurge. It’s remarkable how far this movement has come despite the weakness of Oklahoma’s trade unions, the lack of a living tradition of labor action, and the absence of a militant minority of influential worker-radicals. These obstacles have been offset, at least for now, by the depth of the rank-and-file upsurge, combined with the precedent-setting example of West Virginia. But in the face of a reactionary Republican state government that has refused to make any significant concessions, it remains to be seen whether the strike has the organizational capacity or political leadership necessary to win. The strike began on a cold note. Despite the huge crowds, the action at the state capitol on April 2 was surprisingly subdued. Though the frigid weather didn’t help, the roots of this mood were clearly political. This politeness didn’t last long. As Oklahoma City activist Mark Faulk put it the next day, “Today, teachers brought their outside voices into the state capitol.” Over the course of Tuesday and Wednesday, the crowds turned feisty. Protesters for the first time began chanting in the capitol rotunda; at one point, hundreds even organized an unruly sit-in. Don’t let them tell you that funds don’t exist. They’re sitting right on them. Those sitting on Capitol Hill shouldn’t be building themselves a hill of capital. We need to stop putting profits above pupils. . . . From this day onwards, legislators will fear us hashtag-wielding teenagers more than they fear the oil and gas companies. Republican arrogance has been an important spur for this radicalization. On Monday, state senator Rob Standridge announced that “funding isn’t the problem. Teacher attitude and dialogue is the problem.” Senator Marty Quinn similarly explained that teachers should find another job if they were unhappy with their pay — when student Ariel Grimes challenged him on this, Quinn responded by telling her that she was “too young to fully understand what was going on.” And most infamously, Governor Fallin said that teachers are like “a teenage kid that wants a better car.” Particularly in the wake of these insults, the strike has evolved into something deeper than just a fight for better pay and more funding. Like most mass strikes, it’s become a struggle for dignity and respect. After April 2, the movement grew both louder and larger. Given Oklahoma’s weak trade unions and labor traditions, many of us had privately worried on Monday that turnout in the coming days might decline. Amazingly, the opposite dynamic took place. Both Tuesday and Wednesday were bigger than the day before. And Monday, April 9, was the largest action yet, with an estimated fifty thousand at the capitol. Across the state, at least half a million students, over 70 percent of the state total, were out of school. I am now more optimistic about what the future of our state is going to look like. Until recently, a lot of people have been very quiet, they’ve taken on the opinions of those in power. They’ve trusted their elected representatives. But now people have been woken up to what’s really going on. Being at the capitol is empowering and exhausting. It’s crowded and chaotic, it also often means waiting for hours in line to get inside the capitol. But at the same time it’s so positive and emotional, people have been really polite and kind to each other. People are coming together to find a solution to a common goal. It feels good. It’s huge because this is a battle of endurance. The Republicans are still doing everything possible to wait the strike out. Clearly they are hoping that strikers will get tired, or that public sentiment will turn against the teachers. But it hasn’t worked so far. Contrary to the Republicans’ expectations, public support for the strike has steadily increased since April 2. The most recent poll, by Oklahoma City TV station KWTV, shows that over 72 percent of Oklahomans support the teachers’ walkout “until all of their demands are met.” These are very high numbers, particularly for a state considered to be a right-wing bastion. I want to be heard, but Oklahoman students haven’t been heard. We’ve finally reached a breaking point because our education needs to be funded. And now high school students are taking the reins nationally — look at the movement the students in Parkland initiated. We have real power to influence policy, to influence public opinion. The protests have taught me and my classmates how to stand up for what we believe. Despite the strike’s growing momentum and popular support, the state has stubbornly refused to concede any new increases in school funding. By day four of striking in West Virginia, the Republican Party leadership had split under mass pressure. But Oklahoma’s right wing remains more cohesive and shows no immediate signs of backing down. The need for a 75 percent supermajority to pass new taxes constitutes a further institutional roadblock for the educators. Whereas privatization pushers were caught somewhat flatfooted by the popular eruption in West Virginia, this time they’re better prepared. One ominous development is former US senator Tom Coburn’s recent push to place an initiative on the November ballot to overturn the tax increases passed to fund education and public services. Though such an initiative is opposed by most Oklahomans, it appears that getting it on the ballot might be sufficient to freeze implementation of the recently passed bills. Many Oklahoma superintendents have not ceded to teacher and staff demands to cancel classes. Under intense pressure, some superintendents who had initially hoped to limit the walkout to April 2 have been obliged to subsequently close their schools. Yet superintendents in a large number of districts, including Western Heights in Oklahoma City, have refused to support the work stoppage, resulting in sharp conflicts with their personnel and even collective resignations. Against these reactionary forces, the OEA and the diffuse networks of rank and filers have put up a good fight. The union stiffened its spine after a few days of wavering following the March 29 passage of HB 1010, which granted a major pay increase and minor funding increases. By Monday, April 2, the OEA leadership had clearly decided to stay out for at least a week to pressure the legislature to make further concessions. To the union’s credit, it has frequently pushed hard for big turnouts at the capitol. After winning the historic $6,000 raise included in HB 1010, it adroitly pivoted away from a focus on pay demands by foregrounding the fight for funding. Whatever the OEA’s limitations, it is hard to imagine the strike having reached this point without its active support. It’s also the case that, like in West Virginia, rank-and-file pressure has pushed union leaders further than they initially intended to go. Alberto Morejon, a young teacher with no previous organizing experience, has emerged as the strike’s most influential teacher leader. 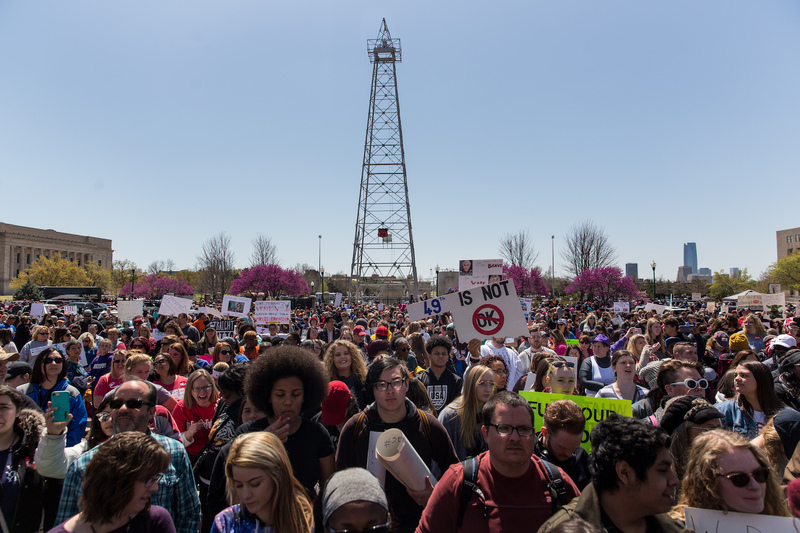 Through his Facebook group “Oklahoma Teacher Walkout – The Time Is Now!”, Morejon played a key role in preventing April 2 from becoming a one-off day of action. He also successfully fought against the union leadership’s initial haziness about its funding demands and its periodic hesitations to make clear calls for increased turnouts at the capitol. Based on the results of an online survey of educators conducted on his group, Morejon has insisted that nothing short of an additional $97 million in funding for public schools would be sufficient to end the strike. Does OEA want us to give up so they can say . . . “Well we at OEA tried”? Are the Legislators waiting us out, or is OEA waiting us out? When is the last time OEA clearly announced what would end this walkout without being extremely vague? . . . This is a teacher movement, and will CONTINUE to be a teacher lead movement. I have met a lot of amazing people at OEA!! But leadership needs to respectfully let us know what their intentions are. If they don’t want to continue, they need to tell us. I’m so very appreciative of OEA getting buses, porta potties, and having a stage for us, and I hope they continue to do so! If they don’t, I will march from Remington to the Capitol if I have to . . . and I know you guys will follow me. . . . The world is watching! We have parents and kids joining in support, we have Superintendents joining in support, and we have people marching from Tulsa because of their support. That’s how much we love our kids! . . . We will NOT stop until we get what our kids deserve. . . . If we stick together . . . we can’t lose! The pressure worked. The next day, the OEA came out with a strong call to mobilize for the following Monday, and it also finally put forward a clear list of minimum demands to end the walkout. According to union leaders, educators would return to work if the governor vetoed the repeal of the progressive hotel/motel tax included in HB 1010 and if the legislature ended the capital gains tax break, a $100 million yearly giveaway to the rich. Morejon’s Facebook group is influential, but Oklahoma’s rank and filers have virtually no direct organizational weight in the schools or in the union movement. This constitutes a major difference with West Virginia, where there was a pre-existing militant minority of class-struggle leaders rooted in their workplaces and unions. In West Virginia, these activists were instrumental in successfully pushing for school-site votes to democratically launch the strike and continue it after the compromises of the official labor leadership. Due in large part to the weakness of all wings of Oklahoma’s labor movement, many school districts have not closed — a very dangerous precedent as the strike drags on. And it remains to be seen whether Oklahoma’s rank-and-file activists have either the political inclination or organizational capacity to overcome a concerted push by the union leadership or superintendents to prematurely end the strike. Up until now, the limitations of Oklahoma’s unions and rank-and-file networks have been offset by the inspiring impact of West Virginia. The conscious intervention of organized radicals is usually required to transmit the lessons of the past into today’s struggles. But because West Virginia’s successful strike took place so recently and was so widely publicized, its lessons have diffused widely in Oklahoma, even in the absence of a militant minority. A wide layer of Oklahoman educators watched West Virginia intently, and they have consciously sought to emulate its success. They saw that even in a supposedly conservative “right-to-work” state, it was possible to strike and win. They also saw that to succeed, the rank and file would have to push hard to initiate a work stoppage — and to keep it going despite last-minute concessions by the state and hesitations by the union leadership. But the ability of educators and their most militant leaders to uphold the West Virginia spirit will now be put to the test. In a major slap in the face to the OEA and all educators, Governor Fallin yesterday signed the repeal of the hotel/motel tax included in HB 1010, thereby cutting roughly $47 million from the original deal. Though she simultaneously signed two bills to raise a similar amount of revenue by taxing casinos and Amazon third-party sellers, the net effect of these measures is that no additional funding for schools has been passed since the walkout began. On Tuesday, the governor also announced that she would refuse to consider supporting the educators’ demands to end Oklahoma’s capital-gains tax break. The strike is now at a crossroads. If Monday, April 9 was the high point of the struggle thus far, yesterday was definitely the low. Turnout was markedly lower, as was morale. Republicans have thrown down the gauntlet. Educators, students, and their allies — most importantly, state workers — will either have to ramp up their pressure or they will be obliged to retreat from this battle for increased funding. Yet Morejon also appears to be bending to the pressures. In the same heatedly debated post, he put forward an idea for a new bipartisan funding proposal that he claims Republican senators personally assured him they’d support. The proposal would raise only raise $75 million, a considerable retreat from Morejon’s earlier insistence on 97 million, which itself was already a relatively modest demand given the scale of Oklahoma’s educational crisis. Even more problematically, Morejon’s proposal was to obtain the funds primarily through regressive means: raising taxes on cigarettes and personal gas use, as well as a small .125% increase to the income tax bracket. With all due respect, the increased taxes above are all (all but 1) REGRESSIVE taxes. . . . Regressive taxes hurt the poor and middle working classes. Progressive taxes force corporations to pay their fair share. The teachers need more money for classrooms but pushing for more regressive tax bills will result in less public support in the long run. . . . The above is NOT ANYWHERE NEAR A FAIR COMPROMISE!!! The admin of this page is now being used by the GOP. Sad! If OK teachers cave then we have just sent the blueprint to every other legislator in the country on how to ignore and deflate our needs and the needs of our students. I’m not one for losing as none of us are!! If I have to give up a year of my retirement to win this, I will!!! I’m All In!! There is NO future for public schools if we lose. NO future for the kids that need an education because that is all that they have!! DO YOU HEAR ME?!?! NO FUTURE FOR PUBIC EDUCATION!!!!! KEEP FIGHTING!!!! There’s no way to predict how things will play out in the coming hours and days. Oklahoma’s strike can still rebound from these setbacks and go on to win. But it’ll be up to the rank and file — and its most uncompromising representatives — to turn this possibility into a reality.